California Prenuptial agreement law is not easy to handle on your own because some strict legal requirements must be met. Our orange county prenuptial agreement attorney will carefully negotiate between the spouses and draft your prenuptial agreement with great care. California Prenuptial agreement (prenup) is an agreement between future spouses made before marriage. The agreement usually establishes a division of properties and debts in case of divorce or death. 1. In case of divorce or when one spouse dies, the community property is usually divided by a court. If you prefer to avoid to having some or all of your individual property acquiring during marriage to be divided up by a court, you can write it in premarital agreement. If you would like to keep your finances separate, a prenuptial agreement is right for you. 2. If you would like to provide for your children from your previous relations, you can set up with your spouse provision so that one or both of you can give up the right to claim a share of the other’s property at death. 3. If you wish to protect yourself or your spouse from debts brought to the marriage; a prenuptial, prenup would help. There are two defenses to enforcement; first, a spouse did not sign it voluntarily; second, unconscious-ability. A California prenuptial agreement will be considered not voluntary unless the party challenging the agreement was represented by independent legal counsel OR WAIVED the representation IN SEPARATE WRITING. A party must have at least 7 days to review agreement before she/ he signs it. IF a prospective spouse is NOT REPRESENTED BY INDEPENDENT counsel she/he must be fully informed in writing of the terms and basic effect of the agreement. 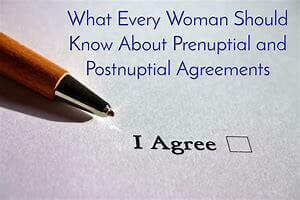 A prenuptial agreement is similar to post-nuptial agreement , but post-nuptial is entered into after a party is married. Any court will consider how fair your agreement is to each of the spouses in order to enforce it. Our orange county prenuptial agreement attorney will help you to come to an agreement fulfilling your intent and be sure that it is enforceable in court.